This was the best place to stay at! My now husband and I rented this place out for our wedding reception and the property was able to accommodate us with the total of 40 guests we had to throw the party. It was an amazing time and place to hold a party and beautiful amazing views! Would definitely recommend this place and stay there again! We just loved it! We had our entire family for the week. This was the 2nd time we had stayed there. Is was great and we all were discussing when we would be back. Our church hosted a couples retreat here, where we rented the two 6-bedroom condos with that amazing rooftop. As beautiful as the pictures and videos are, it's hard to believe that everything looks even more amazing in person! Right when we walked into the condo, the sound of waves crashing welcomed us in... And during our dinner on the rooftop, we had a perfect view of the sunset. All the guests were so amazed not just because of the location, but the condo itself was beautiful. Beautifully decorated, very roomy, was so well stocked (especially the kitchen) you have no need to bring much of anything. We even ran into one of the managers when we were checking in and he gave us a great welcome. The maintenance people were also great, and when we had a question or had trouble opening something or working something, we would just call them and they would drop by in less than 15 minutes. The workers were all very friendly, very helpful. I cannot say enough! This was our first time here, and we all agreed that we would come back year after year. Thank you so much Oceanfront for making our stay in Oceanside so wonderful! The property itself was great, clean, and the accordion doors that opened up to the ocean in the living room was pretty awesome. The roofdeck was amazing as well. Unfortunately, the weather wasn't great for us during the weekend of our stay (Father's Day), so we didn't get to spend too much time on the roof. However, it was still nice to have. The little firepit is nice for evenings. The only negative thing about the house is that the area in front of the house is all rocky and access to a sandy beach area is about a 10-15 minute walk away from the house, which isn't far, but there isn't a lot of sandy beach area and it was INTENSELY crowded during our weekend. I'm assuming it's like that for most of the summer. It would've been nice for us because we had 5 kids in our group. If having access to an actual sandy beach is important to your family, I'd suggest looking at other Beach Front property homes. Room for minor improvement, but overall great stay. Perfect location and view, waves all day and night. Bumpy arrival, but management compensated with late checkout. One washer was OOS and not repaired despite report. Lost elevator for over 2days of our stay which captivated 2of our party who were infirmed. However we enjoyed our stay overall and would consider staying again. The property was great and the family really enjoyed it. Overall it was great. There were some issues with using the Air Conditioner. Would have been nice to just use the A/C and not have to call for maintenance. Cell phone reception was limited and the phone answering system kept hanging up. So I ended up using a text method to communicate. We had a very comfortable and relaxing weekend here at this beautiful property. The unit was nicely decorated, clean and kitchen items were in good conditions. We love the view from the living room and rooftop patio. The staff were very accommodating to our requests. We are very happy staying at this place. Suggestion: For a unit this big, the kitchen sink should have a garbage disposal to prevent clogging. Our third year staying at this location for the Ironman 70.3 Oceanside, and this was another success! My family could just walk out our front door to watch me (and 3500 others) run by! Only .6 miles to the finish line, and was walkable to all of the great new restaurants and breweries popping up in O'Side! The unit has been updated and we like the sails that cover up areas of the rooftop deck now! I will be back next year! One of the most beautiful houses I have ever stayed in. The patio. Was tremendous and was simply amazing! Priceless and the views are fabulous. Was a wonderful treat for my family and friends and will definitely book again!! For our Third Family reunion and the second time we booked the Beachfront Rental only condo's in Oceanside. We booked two top floor condo's including 2 rooftop studio rooms. We used the roof for meals, talent shows, meetings of all 38 family members of the JL family. 20 of which were grandchildren from 1 year to 20 years old. The condo's are perfect for a reunion event. Kitchen is well stocked. Easy access to the beach and the Oceanside pier activities. Surf fishing is possible right out the front of the Condo's. For large group parking is limited but with a real effort to work together parking can be found close to the units. There are 2 garage parking spaces per unit. The staff are very helpful and during the day on site to assist. For us the cost was well worth the investment in having a large clean, safe location for our reunion. We will return in 3 years for the next reunion. Great as always! We used the kitchen this year (we didn't the past two times) and really loved how stocked it was with pots, pans, utensils, dish soap, etc. I was wonderful! Our favorite beach condo by far! The only thing I can comment on was that water pressure. Made duration of taking a shower longer since the pressure of the water was so weak. Minor detail in the grand scheme of things. Scenery was magnificent. Location was a prime spot. The condo was beautiful. The rooftop was really awesome!!! We will stay there again!!! Not enough parking for such a large place. This was our 5th stay in a Beachfront Only condo in Oceanside and this was the best of all the properties we have stayed in! As usual the cleanliness, condition and amenities in the condo were up to the usual high standards of the BFO brand, but what made the difference with this stay was the fun rooftop deck! The panoramic views and huge amounts of space allowed for us to enjoy happy hour and sunsets daily whilst watching the huge waves roll in! I was in town for the Ironman 70.3 California race and the location was perfect for me to get to the start/transitions and my family to spectate and meet me at the finish! This was a perfect staycation! I booked this unit for a bachelor party and was beyond impressed. we had about 14 guys and everyone slept comfortabley. The roofdeck patio is shared with the unit next door but there is PLENTY of room for everyone. The pictures online look nice, but it's much better in person! Me and 6 of my business associates rented this villa, I must say that the view and the space was amazing. We woke up each day to the sounds of the ocean and barbecued in the evening to the most amazing sunsets. enough bathrooms for us all and each had a bedroom. the rental came equipped with everything we needed. If you have a large family or have a business group don't think twice about this rental its a sure thing! I cant wait to go back with my family next time soon. We usually stay here every year for our resident physician retreat. We rent 908-3R and 4R. We love how the rooftop was remodeled. We let our 29 residents have lunch and dinner up there and they love it! We have stayed at the same property twice. I love how they update their bedding furniture, and pillows. Awesome location. Nice and clean. Beautiful view. We love it here! It was the best ever! We had a wonderful stay. the staff was amazing too. We stayed at this property for five days. It was a perfect spot for our family reunion. Each of six adult couples took one of the bedrooms. Plenty of room to be together and lots of places to escape to for privacy. We especially enjoyed the delightful rooftop area. We also appreciated the safety measures for our toddlers, with all stairs situated safely behind locked doors. The rental was clean and in good repair. The one time we needed some plumbing help, it was taken care of immediately. They also took extra time and effort to provide us an extra parking space. Great service. Four stars for location because we had to go left a ways to find adequate sand for the kids to play in on the beach, but we managed fine. We will be back! The rental was spacious and inviting. Watching the stunning ocean views from the big windows and/or balcony everyday were beautiful. It was perfect for our mom who wanted to enjoy the beach without always having to be outside. We had a problem with the dishwasher, but got help right away. The common area rooftop was also a great space to have a meal, play games and just enjoy the scenery! The beach itself is right there, but know there are a lot of rocks in the sand and be mindful of the tide reports. Bring water shoes. Overall, it was great! This was a very last minute trip by my family (as usual with most families.) We wanted to have a big trip because on of our family members will be moving away for a few years so we wanted to make it special. The Beach-house was absolutely amazing. The inside was perfect with plenty of space. The view couldn't have been better either. We came during whale season, it was fun to see things like that. Great job Beachfront Properties, you've outdone yourself and we will use you again for sure. had a relaxing valentines getaway with a couple of our friends,the rental is spacious, luxurious,with all the amenities,walking distance to restaurants,the pier, shopping.we stay at these oceanfront rentals every year with the kids and they love it as well.great place to vacation ,any occasion.highly recommenced. We were back at 809C again for kids spring break and Ironman Oceanside. We were delighted at the renovations that included CRO flooring, new furniture, upgraded art and lighting! We also noticed new touches like additional cutting boards and a coffee grinder! These items we noted last time we stayed. It was great to see our feedback responded to! Our group had an outstanding stay! Everything was perfect. We couldn't have asked for a better place to hold our gathering. Only negatives were no garbage disposal and no wireless phone service on AT&T, T-Mobile or Verizon. Must be a blank spot in the location. Overall it was superior property. Well constructed and supplied with beautiful view. I would recommend to anyone. We were on the top floor with 7 children ages 2-15 and the people below us had to listen to all of the footsteps on the beautiful slate floors. Sorry. Those with small children stay on the bottom floor. We will next time. This was the second time that our group rented the property (for nine nights). It felt so much like home that we didn't want to leave. The house is beautifully kept, and it had everything that we needed for our stay. The staff is extremely accommodating and we hope to keep coming back each year! Loved the vacation rental, it was a beautiful weekend and it fit our family perfect. Loved the condo! Plenty of room for 16 of us. Kitchen was amazing and nice place to hang out. Rooftop access really made this condo a gem. Only problem we had was gas stove did not get hot very quickly so it took a long time to make things. The management company did not like me shipping packages down ahead of time but they were able to accommodate me and were very professional about it. Overall I would definitely stay there again. Perfect location and building type for a guys golf vacation place to stay. We had a very enjoyable stay with plenty of room for everyone. This beautiful unit is exactly as described and pictured. First and foremost, the view is spectacular. Imagine cooking in the kitchen and being able to look out the wall-to-wall windows to see the waves breaking. The furniture and beds are comfortable. All rooms are nicely appointed. The kitchen had absolutely everything we needed to prepare some of our meals at home. The area is quiet and relaxing. Plenty of actual beach within 1 minute walk. No negatives here. We've used these condos for corporate meetings several years in a row and love the location and facilities. Our stay was simply amazing. The company was extremely accomodating, and responded to all our questions within less than 30 minutes. Lease signing was seamless, and any minor issues we encountered during our stay, there was someone basically onsite to address. The views from the house were breathtaking. The kitchen was beautiful and stocked with everything we needed. 15 adults stayed in this home and we had more than enough room. There was ample common area in the living room and the flow directly into the kitchen allowed us to spread out a bit, but still be together. All in all, great experience. I would definitely recommend this company and this property in the future. We were a bit worried about no air conditioning, but like the contract said, the ocean breeze was more than enough. We were running for blankets more than we were complaining of being hot. Loved the condo and location. Our 2 soccer teams had adjacent upper level condos that shared rooftop. The rooftop was perfect for social gatherings and just chilling out in the sun. The condos were spacious and the bench beds were surprisely comfortable. The realty company were awesome to work with and were very accommodating and quick to repair anything. They do need to improve the cooking knives though. That would be my only complaint. My group went for a weekend retreat to oceanside and the house was absolutely perfect for us. We all had enough space and great ammenities, we spend most of our time on the rooftop lounge and walked to the pier for breakfast and took a stroll along the beach. I love north coast village so it was great that the house is close enough to walk/short drive to take my friends over there. The views are spectacular and the kitchen is great for cooking for groups! I hope we can definitely go back again. I left notes on the sheet in the book about several things but need to add two more issues. We were uncomfortable with the cleaning/maintenance people leaving the side walk gate propped open several times a day. It is a safety issue for young children who could get out and unauthorized people could get in. Also, when scheduling, we were told that there was wheelchair access to the beach and that we could get a special wheelchair from the lifeguard for the beach. But there is no longer a lifeguard station nearby and the ramp access is washed away at the bottom. Plenty of space for all guests. Beautiful home and roof top terrace was amazing. Our family had a great time and wants to come back. Cost was a little prohibitive as we had wanted to stay 5-6 days but could not afford it. Loved the views and the spaciousness of the house. We had a bedroom for each family and the kids loved the window seat beds and couches. Ocean was great, walks on the beach so relaxing. Would have liked lids for the pans and a plug for the large fry pan, foil or baggies. We realized you added that to your letter, but for the price seems they could have been included. Also would have like more than one dishrag and two dish towels. We did all of our own cooking and meals there. Would also have liked to have known about the pier activities and bikes available, need for wet suits as it was cool,etc so that we could have maximized our stay. All in all though we loved it! What a nice place to stay - quality condo at a great price...much better than a hotel! Gathered our kids and grandkids for a group vacation. There were 6 kids and 6 adults.The grandkids loved the ocean and spent most of the day at the water. The condo was all I hoped it would be-large, well kept,& fairly well stocked. For this many people tho alittle more pots and serving bowls would have been nice. We had to borrow a couple of pots for spaghetti. However, We had a GREAT time and would certainly return or recommend to anyone! The unit was exactly as promised. It had beautiful views, was clean, well appointed and very comfortable for our group. However, the construction next door was absurd and started everyday at 7am and continued until the early evening. Jack hammers, shouting, banging, a crane, and that constant beeping noise. The houses were so close together that it was not enjoyable to be inside or outside at our unit. Of the 4 days, we only had Sunday without the noise which was the only day that we planned to be away from the unit at the zoo. It is the same property management company that was doing the work on the adjacent units. If they would have told us we would have just booked a different unit. There were even huge signs posted with the permit information saying there was going to be construction. It was within their control and they should have expected that it would be an issue. Even if they weren't aware at the time of booking, they could have offered another option to us when they scheduled the construction. It ruined our stay. I can't say enough good things about BeachFront Only Vacation Rentals. I was looking for a wheelchair accessible house in the San Diego area for the weekend of Sept. 6-8, 2013 to accomodate 15 people total, 8 of whom were in wheelchairs. BeachFront Only is the only place I found that even came close to meeting our needs. The pictures were beautiful and everyone that I talked to on the phone (particularly Sheva) were so friendly, accommodating, and willing to help make things work for our group. When we arrived at the location on Friday we were all blown away by how beautiful the condo was, the ocean view and the rooms were just beautiful and there was so much space, the pictures did not do it justice at all. The ADA accessible bathroom was wonderful and the other rooms and bathrooms worked for our wheelchair users as well. The elevator to the amazing rooftop deck was every convenient and the only problem we had with our entire stay was that the elevator had problems throughout the weekend - the doors wouldn't close fully on the first and third floors, causing the elevator to be stalled. I called the "emergencies only" number on Friday night and someone was sent out right away who identified the problem and said they would work on fixing it. The elevators continued to have trouble throughout the weekend but we were able to manage by making sure all the doors were fully closed each time we used the elevator. Other than the elevator problem I don't have one bad thing to say about the property and the management, it was beautiful and we would love to be back in the future! The unit we stayed in was beautiful. Very well stocked with utensils and supplies and well maintained. Plenty of room for 13 people. (We could tell the kids "Go play on the roof") Great views. Staff available for our questions and hard working cleaning staff. Thank you!!! So great to have so much space! We saw dolphins every morning, and had everything we needed to cook for a large crowd. I have rented several BeachFrontOnly rentals over the years. I am always impressed with the ease of the transaction and the quality of the properties. The condo was great for a quick getaway with 5 couples. Love the views and the Oceanside community. Specifically for this property, it does have a shared deck with one of the other condos. This was not a problem for us, but could certainly be uncomfortable if you don't have good neighbors. Also, the 6th bedroom/5th bathroom is a separate room on the top deck. It is kind of a cool room, but we did not use it - since you access it from the shared deck. Great property - definitely recommended. Came into Oceanside for a very special weekend of the wedding of our son and we were blown away with this gorgeous location. Coffee in the morning on the patio overlooking the ocean, evenings enjoying the sunset and plenty of room for everyone to spread out. Thank you for helping to make this such a memorable event for our family. Beautiful property, with great ocean views. The trip was great, if I had any complaints the CITY needs to do SOMETHING about the dog droppings !!! beautiful with an amazing view!! Beautiful rental by the beach. Property was built for vacations. We were so pleased we already started to plan for our next stay. Staff was readily available, polite, and extremely professional. It was wonderful having the garage and made us feel very safe!!! Very nice neighborhood!!! Breathtaking views. We saw orca's, seal's, sharks, & dolphins, and the girls enjoyed the surfer's!! maintenance issues (smoke alarm battery beeping) were promptly resolved. Everything promised to be in the unit was there. phone were pleasant, helpful folks. Please share this message with everyone involved. It is a beautiful place in a beautiful location. Well worth the price. Been there before, definitely going to go back. We had 5 couples who stayed and there was plenty of space for all. The house was relaxing and had a great view. Excellent, very large condo on the beach. We stayed here for one week in March. The company was quite nice to work with and the unit was huge. It exceeded our expectations. Very clean and well managed. I would not hesitate to stay here again or use BeachfrontOnly again. Beautiful home! We had an excellent time. we had some maintenance problems, which were resolved almost immediately. the vertical blinds needed some attention and some slat replacement. the little tabs installed on the tops to fix the tears really don't seem to work that well. there is an extrememly noisy fan attached to the dryers, which was unplugged during our stay. since laundry was going in the evening, sleep was impossible in the two rooms next to the laundry area. general maintenances needs to include a review of the lightbulbs and door hinges. the fridge in 809c froze our food. against the request in your note, we adjusted the thermostat down as much as possible, but we ruined still more food. the freezer was fine. you provided a second fridge, which certainly helped. there was a water leak from the bottom of that fridge both in the evening and again in the morning, when we awoke. i don't know how often you do walk-throughs of the units during the summer, but it probably needs to happen a little more often. We loved the property, the view and the close proximity to the ocean. We didn't care for the town of Oceanside. My only other comment is that I wouldn't refer anyone to Raw Skin for rentals. The equipment was in significant disrepair-unsafe bicycles with premium prices. Thank you again for the wonderful place and the considerable rate discount, it was a blessing for me and our family! Thank you to the Beach Front Only Staff and unit owner for access to the roof top. CEO and Chairman were impressed with the facility and staff. I am sure we will be in contact for future events. The property was extremely nice, clean and well furnished. The location right on the beach is what drew us to this property and we were not disappointed. EXPENSIVE, BUT WORTH SOME PREMIUM NO DOUBT. BOTH TRASH/GARBAGE ROOMS OVERFLOWING. MAYBE SHOULD BE EMPTIED A BIT MORE OFTEN DURING THE PEAK SESON. Our only reason for phone calls to the management was that the Hot Tub was not turned on. It took many hours to heat up, so wasn't really ready until halfway through our stay. However I was very happy with how the maintanance man came out quickly each time we called and was very forthcoming explaining how long it takes to heat up and giving us options. We felt our concerns were addressed quickly and accepted "these things happen". Thank you for a beautiful weekend in beautiful accommodations...many of the ladies were interested in doing this again or using BeachFrontOnly for a family reunion. Our mom's 90th birthday celebration was a success at this beautiful home in Oceanside. The five bedrooms enabled each family to have their own room and the one level floor design was especially nice. Our large group was able to enjoy each others company without feeling crowded. The great picture window overlooking the ocean allowed our mom to get to watch for the first time her kids and grandkids surfing. Our weekend was everything we could have hoped for and more. A great experience in Oceanside! This was the fifth time we have stayed at this property. We like to visit when if is off-season and the prices are lower. Amazingly, when we've visited in the winter, we've had great weather each time! The property is large and beautiful. The bay window overlooking the beach is perfect. I love that it has a shower outside for rinsing the sand off, and double washers and dryers inside to keep the laundry moving through after sandy visits on the beach. 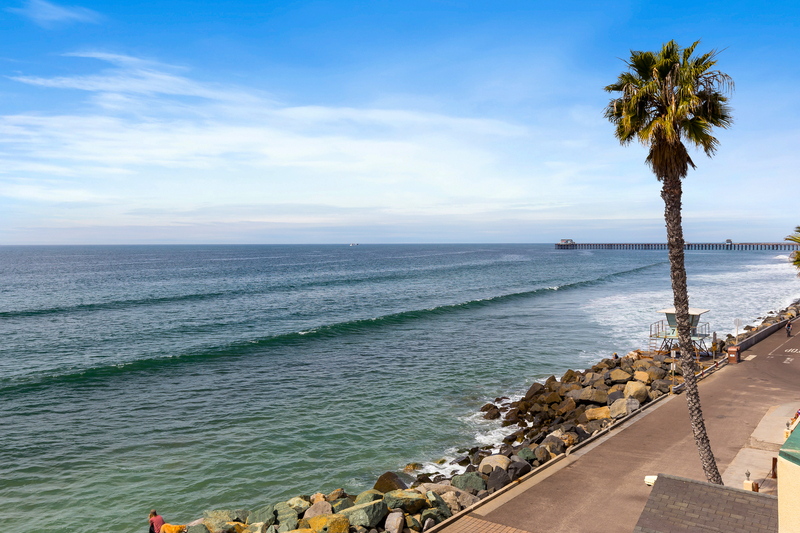 Our family loves the location and the experience in Oceanside at this property! While the location was great and property beautiful, the price is a little high in comparison with other properties we looked into. We would love to return to Oceanside again, but would probably look for lower priced accomodations. The only negative comment we have is the noise coming from above on the deck early in the morning (running, jumping, etc. of children). The deck should be closed until at least 8am (quiet hours). We are sorry to hear you felt the property was overpriced, however, we hope our guests can see the value in our properties compared to other rentals in the area; we hold our properties to a high standard and our prices reflect that. If you need smaller accommodations or if you are looking to stay within a certain budget, our helpful reservationists are here from 7am to 9pm daily to assist you with narrowing down the right option. We also do strive for a good neighbor policy and are sorry to hear you were inconvenienced by noise in the morning. In these types of situations if the guests are violating the Oceanside noise ordinance (10pm-7am) you may call the Oceanside Police Dept. or contact our office so we can quiet the neighbors down. There were a few little details of the condo that needed fixing up, but I left those comments on the comment card. Please let me know if you did not recieve those notes. We enjoyed our visit and will hopefully be back someday. Everyone was overwelmed by the "Beach House" layout. Privacy in sleeping, ROOM for daytime visiting, game playing, cooking. This place was well thought out and the management was brilliant! Not needing a "key" was priceless! Only having to take out the trash and your own "stuff" the final day...again, priceless! We plan on doing this again and will definitely use ONLY this agency! Awesome vacation rental! It was so nicely decorated, clean, and comfortable! I would definitely come back again! I am the family member who arranges the extended family reunions for my side of the family every 3 years. It is quite a challenge, since we have almost 60 family members to accomodate, and they come from as far away as Alaska on the West coast, and Virginia on the East Coast. This time, I found your properties, and asked them all to come to California. From the moment each family arrived to the moment they left, they couldn't stop saying how much they loved it. In fact, by the end of our stay, they were all saying it was, without a doubt, the best reunion ever! The property and the location had something for everyone, from the tiniest tot to great grandmother. It was just great! Thanks again, and maybe we'll be seeing you for the next reunion! A++ Beachfront only took care of us from the very beginning. When we couldnt stay in the place we first booked due to a leak they upgraded us and made us feel welcomed. A perfect retreat place. The beds were very uncomfortable. Get new beds and it would have been perfect !! The best vacation rental!!! Our visit was amazing! I have already referred a number of people to you! A wonderful experience from reservation through stay!!! The only disappointment was there was not any real beach or patio area for sitting in the sun as a group in this particular rental. We had a mervelous time at this property! The view was fanstastic and the property was excellent! Great amernities, nice layout, well-stocked, and perfect for groups. Our party had a great time! It was nicer than I thought it would be. I would highly recommend this to anyone.